The best way to summarize my career is to say I’ve been in a canoe paddling my way through life. Where the current was strongest, that’s where I went. On Wednesday, December 3rd, renowned conservationist, tour guide and professional speaker, Brian Keating, will deliver the keynote speech at the Green Jobs Forum. We caught up with Brian to ask him a few questions about his own green career. When did your fascination with the outdoors begin? I started bird watching at 12 years old, when I received my first pair of binoculars and then my first single lens reflex camera – these were the two tools that slowed me down and made me look and appreciate the natural world around me. Thus began my thirst for knowledge. Was there any one event that steered your career in one direction? While I wouldn’t have thought that bird watching would lead to a career, my career developed by following my heart without question. At 14 years of age, I attended the first Earth Day in New York. It inspired in me an ecological way of life. That manifests in everything we (my wife and I) do. We have an energy efficient home with solar panels; we supplement heat with wood, and step as lightly as possible on the earth’s surface. Tell us about your own green career. The current first led me to the Canadian Wildlife Service – the scientific arm of the government – where I was responsible for habitat monitoring and population dynamics. I was working as a naturalist – a job that was incredibly varied and which allowed me to follow my interests. I led trips and put on programs, interpreting our natural world in Southern BC and Southern Saskatchewan. This role gave me momentum to apply for Director of Education at Calgary Zoo where I built the education department for 15 years. Working at the zoo allowed me to enter into world of conservation by promoting the fundraising arm to keep the green in the wilds of the world. Conservation Outreach extended those efforts beyond the walls of the zoo, to discuss the importance of maintaining ecosystems around the world, like the Wechiau Community Hippo Sanctuary in Ghana. What has been keeping you busy in retirement? Five years ago, I retired from the Calgary Zoo and started GoingWild.org – an eco-travel and professional speaking company. 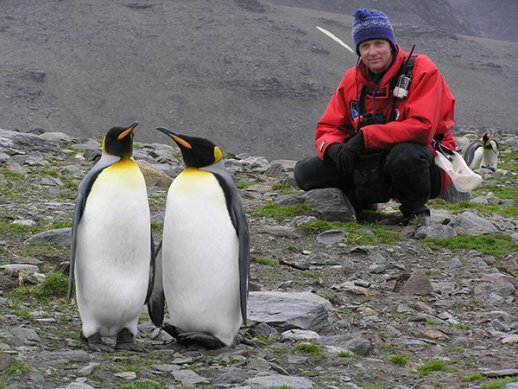 I spend about half the year leading civilized adventures to all reaches of the world – from Africa to Antarctica. When I am in Calgary, I am hired to educate and entertain audiences by sharing my experiences. Your keynote speech at the Green Jobs Forum is about Cold Leadership. What does that mean? My talk will use the story of Ernest Shackleton’s failed Antarctic expedition and how Shackleton’s willingness to think differently ultimately saved the lives of his team. I will take people on a video journey into the Antarctic to see an intact ecosystem of such abundance – what earth can be and can remain as if we adopt Shackleton’s ingenious approach to doing things.